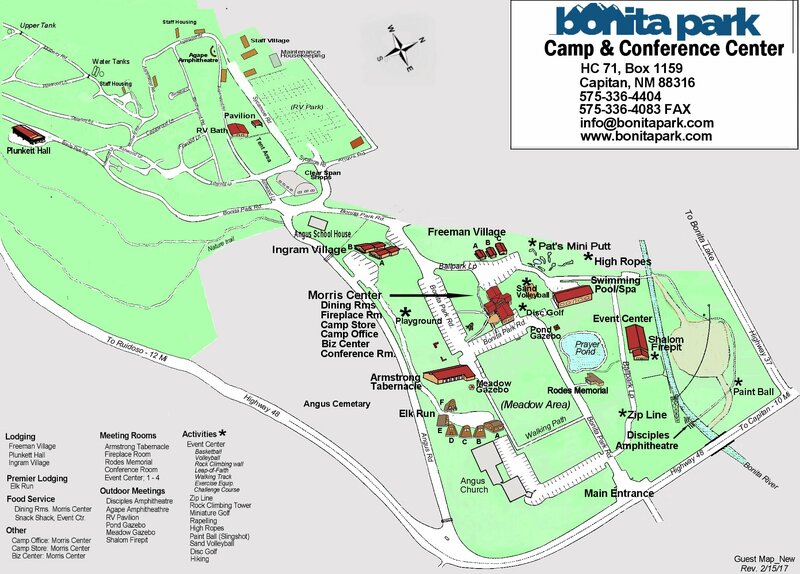 Bonita Park is owned and operated by the New Mexico District Church of the Nazarene. The Church of the Nazarene is a Protestant Christian church in the Wesleyan-Holiness tradition. Organized in 1908, the denomination is now home to about 2.3 million members worshipping in more than 29,000 local congregations in 159 world areas. The New Mexico District was formed over 100 years ago in 1913 and has grown from 7 churches, with 141 members, to 40 churches with almost 6500 members today. Finding your way to a campfire at agape amphitheater, or navigating to your meeting room can be a bit confusing for a first time guest. If you need a hand, or just want to get a feel for the layout of the camp, please view the map at the link below.